Oh, where to begin with Rebel Heart, the sequel to Moira Young’s fantastic novel, Blood Red Road? My head is a bit in a scramble after listening to it. Did all of that just really happen? Rebel Heart starts off just a little while after Blood Red Road ends. This time it begins with Jack as he goes to meet Molly to tell her about what happened to Ike. This little look into what Jack is doing is a little off-putting at first. I was so used to Saba and seeing everything happen around her. Later on, as I continued reading, I realized how important that opening was because I was reminded of the kind of guy Jack is, and it re-enforced my support of Saba and her mission. And what about Saba’s mission? Saba, Lugh, Tomo and Emmy’s journey to the Big Water ends up being much harder than anticipated. Saba is eager to get there to meet up with Jack, which is getting on Lugh’s nerves. In fact, anything about Jack gets on Lugh’s nerves. On the way, they stop at a settlement to rest, and there they find out what’s going. Saba meets a young girl who tries to enlighten Saba about her destiny. As Saba tries to deal with her grief, a possible message from Jack comes her way, leading her on an epic journey to find him. Hurt, betrayed, and deceived are words that echo throughout Rebel Heart. Those words pretty much sum up almost everything that happens in the book. (It also sums up my feelings toward Moira Young right now. LOL) After everything in Blood Red Road, no one is the same. Now that Saba and Lugh are back together, they’re confused as to why things aren’t back to normal between them. They keep seeking the natural camaraderie that always had comforted them. They’re also both dealing with post-traumatic stress order in different ways. We don’t understand Lugh’s because we never get to be in his head. But we do understand Saba’s, and it’s a hard time to feel it all with her. That’s how we go through the whole novel, just feeling with Saba, her love, grief, confusion and wonderment. Author Moira Young doesn’t shy away from all the “bad.” Young doesn’t pretend that Saba’s actions don’t have any repercussions. They do, and she lets them come at her full force, which makes Rebel Heart so effective and much better than the first book. Even though I loved reading Blood Red Road the way it’s written in dialect, I was eager to continue the story in an audio format. I wanted to listen to Saba’s distinct voice as she goes through her journey. The audiobook of Rebel Heart was more than I expected. It allowed me to become so immersed into Saba’s life and her story. Remember how I said that I felt everything she felt? Well, in audio, that increased by tenfold. Normally, I’m quiet as I listen to audiobooks; this time I gasped, laughed, clenched my hands and covered my face. While I appreciate the style in which the Dust Lands books are written, there’s definitely something to say about the audiobooks. Heather Lind is the narrator; her voices and accents are perfect. She does an excellent job bringing these characters to life, especially Saba. Altogether, Rebel Heart is the best audiobook I’ve listened to all year. As the story unfolds, it gets so tragically complicated. Questions are answered, but some of the most important ones go unanswered. Why did this all happen? And what does it all mean? Even though the book starts off slow, the last half is packed with action and major developments. (Keyword: major.) It’s totally unpredictable, causing it to be so breathtaking and heart-shattering. There is no hindsight or dramatic irony for the reader. I was just as clueless as Saba and still am. If the events and ending of Rebel Heart are any indication, I need a year to prepare for whatever the third Dust Lands book has in store. 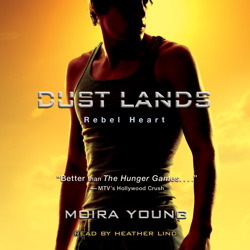 Rebel Heart by Moira Young is now available where books are sold. You can purchase the audiobook at our TYF Store, powered by Amazon.